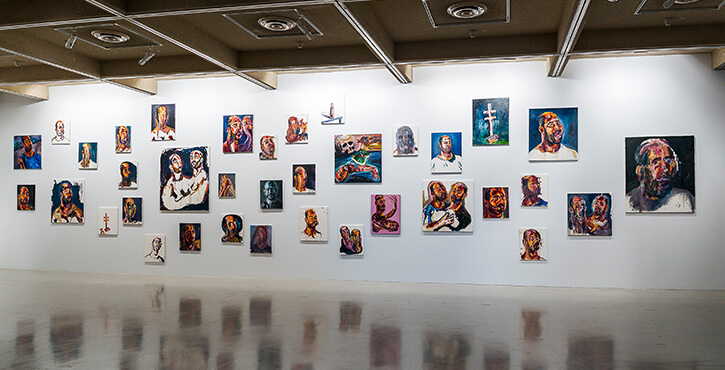 Facing the death penalty, Myuran Sukumaran chose to create art that pointed to redemption and hope. On April 29, 2015, Myuran Sukumaran was executed by firing squad in Indonesia. He had been arrested 10 years earlier for smuggling heroin, and was part of the group of Australian drug mules who came to be known as the Bali Nine. In the years between his arrest and execution, Myuran completely turned his life around. He became a Christian, an artist and a model prisoner. At Kerobokan jail in Bali, he ran an art studio, and taught English and computer skills to his fellow death row inmates. In this episode, Christie describes her first meeting with Myuran, how she helped him navigate the last few years of his life, and the promise she made to him to keep fighting against the death penalty. Also, Michael Dagostino, Director of the Campbelltown Arts Centre, walks us through a new exhibition of Myuran’s artworks, Another Day in Paradise.